The Jazz Area in the Department of Music at the J. William Fulbright College of Arts and Sciences has been busy the last few weeks. A large jazz ensemble went on tour in Mississippi and Louisiana, bringing home two prizes from the 2018 Alcorn State University Jazz Festival. Last week, two small combos visited a number of counties in Arkansas to share their music and reach out to parts of the state not typically visited by University of Arkansas students and faculty for recruitment. Professor Chris Teal took four students to four districts in Central Arkansas. Haley Bowman (bass), Jordan Strickland (piano), Asher Perkins (guitar), and Blake Manternach (trombone) performed for area schools including Booneville Junior High and High School in Logan County; Academics Plus Charter School in Pulaski County; Guy Perkins Elementary, Junior High and High School in Faulkner County; and Pangburn High School in White County. 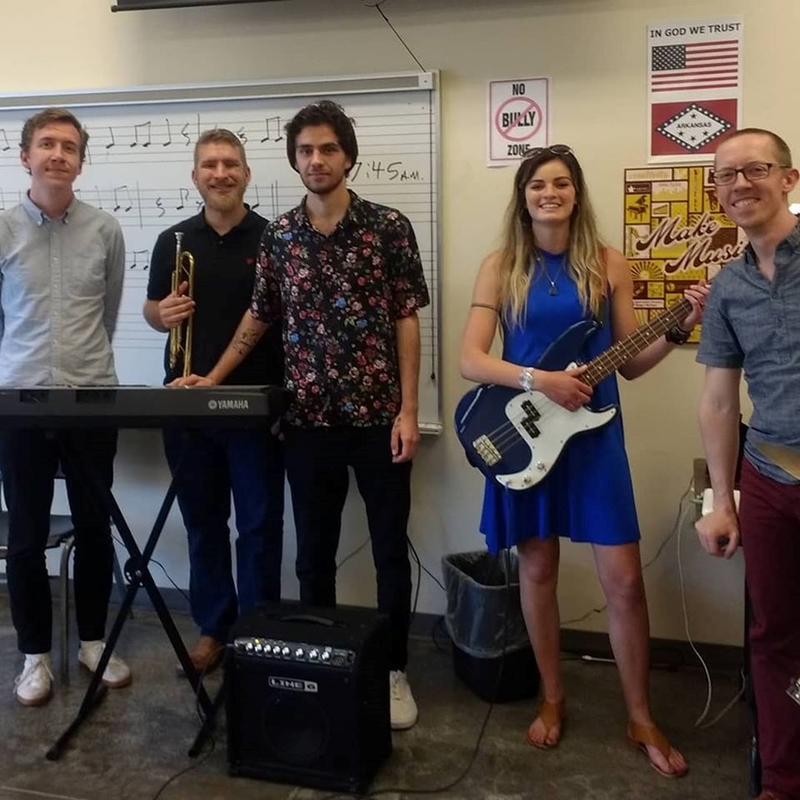 In addition to performing, the combo taught students the traditional New Orleans jazz standard "Liza Jane" by ear and had all students improvise with the group. The workshops highlighted the growing interest in jazz studies and improvisation at the University of Arkansas. Teal said that, "the students played well and we all had a lot of fun talking with students, teachers and community members about jazz and the upcoming CMS jazz camps this summer." Rick Salonen took another combo to southwestern Arkansas, visiting seven counties. Van Powell (bass), Florencia Zuloaga (piano), Felipe Antonio (guitar), and Don Mayall (drums) played in both schools and community settings. The group gave performances at De Queen High School in Sevier County; Prescott High School in Nevada County; Hope Elementary School in Hempstead County; Verona Restaurant in Miller County; Ashdown High School in Little River County; Polk County Public Library in Polk County; and Waldron High School in Scott County. The group played well and were invited back for future performances in the area. In total, the two jazz groups gave 14 appearances in eight new counties in the Music75 Initiative. The Department of Music continues to build new relationships and present great performances and workshops throughout the state. The county count is now at 38, which is just over the half-way mark in reaching the initiative's goal of brining music to all 75 Arkansas counties by 2020. For more information about the project, visit fulbright.uark.edu/music75.